Researchers at King’s College London, the University of North Carolina, and Stanford University found that people with anorexia had a genetic variant on chromosome 12, but those without the disorder did not. This chromosome has been associated with type 1 diabetes and autoimmune disorders. The team found faulty genes in over half of the anorexic patients they analyzed – genes that are associated with neuroticism, schizophrenia, and metabolism. “We identified one genome-wide significant locus for anorexia nervosa on chromosome 12, in a region previously shown to be associated with type I diabetes and autoimmune disorders. We also calculated genetic correlations — the extent to which various traits and disorders are caused by the same genes. 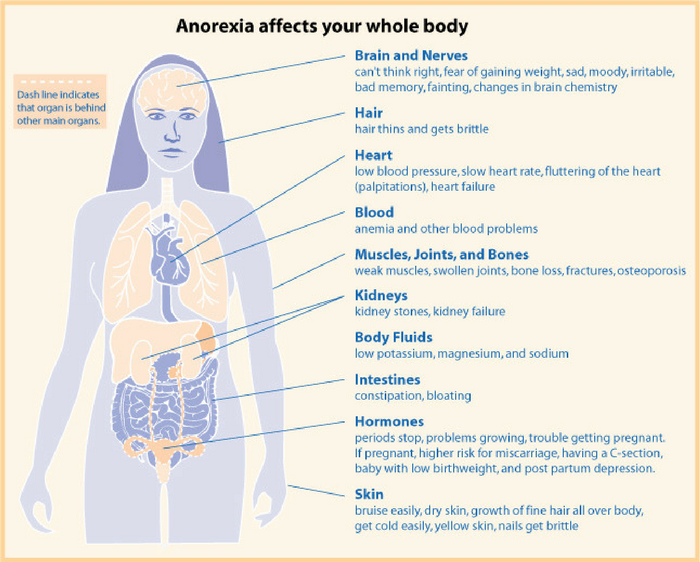 Anorexia nervosa was significantly genetically correlated with neuroticism and schizophrenia, supporting the idea that anorexia is indeed a psychiatric illness. The researchers are continuing to increase their sample sizes and view the outcome of the study as the beginning of genomic discovery in anorexia nervosa.